The Lapland Bunting in winter has a heavily streaked back, patchy head pattern, rufous brown nape and white underside, it is easily confused with a female Reed Bunting. Male and female birds in winter are very similar. 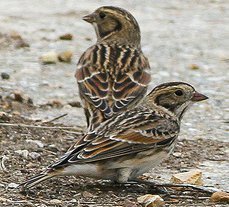 The Lapland Bunting breeds mostly in Scandinavia and is a very rare breeder in the UK. Most often seen in the UK as a passage migrant in coastal areas. Breeds on tundra and areas of high altitude. But can be found in coastal areas when on passage. 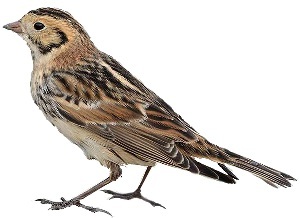 The Lapland Bunting is known to breed in the UK, it was first recorded nesting in 1977, however most of the birds recorded in Britain are on passage with around 700 sighting per year. 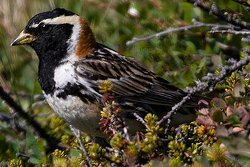 The bird is also known as the Lapland Longspur. The male in his summer plumage is an altogether more distinctive bird with black face and breast and a bright rusty red nape. Lapland Buntings in winter plumage, note the birds characteristic rufous brown nape. The female Reed Bunting has a pronounced eye stripe and lighter coloured back than the Lapland, it's head is usually plainer and breast streaking browner. Female Lapland or Reed Bunting?